The Medicine of the Prophet or Sunnah Healing is one that is followed heavily in the Middle East and around the world. Not only did Prophet Mohammad, give us the revelation which was handed down to him from Angel Gabriel that black seed was a cure for all disease, He also told us on how to live and what foods in addition to black seed and honey healed. You can read this book on the Medicine of the Prophet that I highly recommend. Black seeds and honey – and their many different derivatives – have been used for a variety of health purposes for over 3,000 years. Traditionally used as a folk remedy for restoring balance to the body, it was long believed that black seed oil helped to reduce inflammation, improve metabolism, and improve digestion, respiration, and circulation. As for honey, it was believed to have similar health benefits and was often used to treat illnesses such as high blood pressure, headaches, and fever. This statement alone can be used as the basis for such a large body of medical research that it is almost unbelievable how relevant, important, and effective this prophet advice from fourteen centuries ago is to our daily lives today. Eating less leaves you feeling leaner and lighter, and is more likely to help you avoid the illnesses that many people develop thanks to a sedentary lifestyle coupled with a lack of energy and exercise. This article states that such a lifestyle is deadlier than hypertension, smoking, and diabetes! While there is much talk about the healing and health properties of black seed oil and honey in Islam, what is important to note is that the health benefits of these natural remedies apply to everyone. We are all part of the same human family, and good advice is good advice, wherever it comes from. For Muslims, even without the backing of science, we believe in the advice of our prophet, and so we follow and obey accordingly. That’s what it means to be a Muslim – the word literally means ‘to submit.' The backing of science only makes our faith in the truth of the word even stronger, and as part of our Perfect Healing newsletter, we want to share this with the world. Black seeds come from NigellaSativa, a small plant commonly found across Asia, India, and Europe. Honey, of course, comes from beehives – nectar collected by bees from flowers. Because bees collect nectar from many different plants and flowers across any geographic region, honey from different places contains enzymes and nutrients of various types, with all of that natural health and goodness condensed into a pure, sweet, health-promoting natural remedy that is as beneficial as it is tasty. 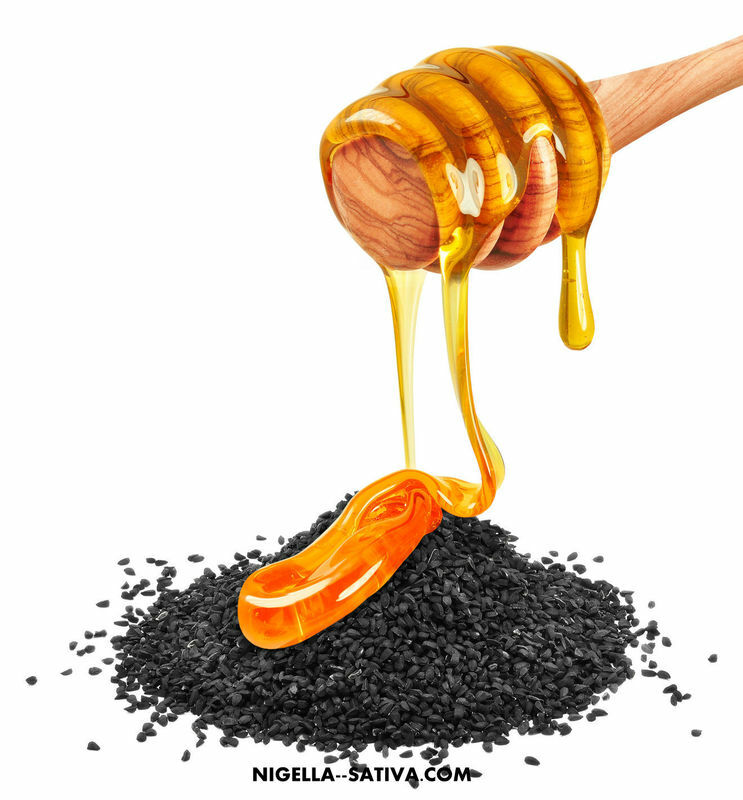 Black seed oil is often mixed with honey to make black seed honey. The long-held belief of the health benefits of black seeds and honey have somewhat only recently been backed by scientific studies that have actually proven that black seed oil and honey both contain antioxidants that can reduce cell damage and promote cellular healing in patients of all types. Well, one of the primary constituents of black seed oil is thymoquinone, a chemical that has antioxidant properties, along with specific acids such as oleic and linoleic acids that decrease blood sugar, triglyceride, and cholesterol levels. As for honey, it contains numerous plant-based substances with antioxidant properties that can restrict the growth of cancer cells and can help in recovery from flu, colds, autoimmune illnesses, and high blood pressure with regular consumption. Black seed oil can help reduce your appetite, has shown positive results when used as a cancer treatment, and can even help improve the luster and shine of your skin and hair. Thinkers as old as Hippocrates from thousands of years ago used it directly themselves for fighting digestive problems, which only makes sense to us today based on the findings of modern science. Numerous studies, such as this, show that black seed oil can also help with autoimmune disease, thanks to not only the healthy acids it contains but also because it is a good source of folate, iron, copper, zinc, phosphorous, and vitamins B1, B2, and B3. -Eczema, psoriasis, and skin fungi: -Black seed oil has long been used for skin problems such as eczema, psoriasis, and fungal infections as it helps to soothe inflammation while improving the speed at which the skin heals itself. -Digestion: Black seed oil helps decrease stomach pain and bloating, and it can even inhibit the growth of various cancer types in the digestive tract. -Cholesterol and blood pressure: Black seed oil and honey have both been shown to help manage cholesterol levels in the body while helping to maintain a steady and healthy blood pressure level. Weight loss: Thanks to its blood-sugar-lowering effects, black seed oil can help in weight loss, appetite control, and reducing cravings, meaning it can help you lose weight without having to make significant alterations to your basic diet. And that is why we always suggest this brand as it is the best available anywhere. Look for brands that sell raw, unfiltered, and unprocessed honey. This kind of honey is sometimes an acquired taste, but once you get used to the taste of real, natural honey, you won't want to go back to anything processed ever again. All of this is the science behind black seed oil and honey. Now for the spiritual healing part of things.